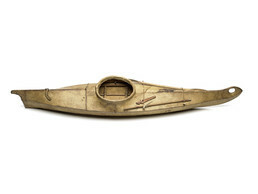 This model shows the traditional Norton Sound kayak design – a wide, stable boat with a large cockpit, circular opening through the bow, and handhold on the stern. A miniature bird dart, throwing board, and double-ended paddle are lashed under the deck straps, just as on a real boat. Working kayaks could carry heavy loads, including seals stuffed inside and an extra passenger who faced backwards in the cockpit. Men built frames for the boats and women sewed the bearded sealskin covers.